This can come in handy and is a great tool to use for great customer service. Use this in case any adjustments need to be made for any reason. How to Add a Payment to an order (if one didn't already exist). How to Approve a transaction. New Card will be selected by default, unless a card is already stored. 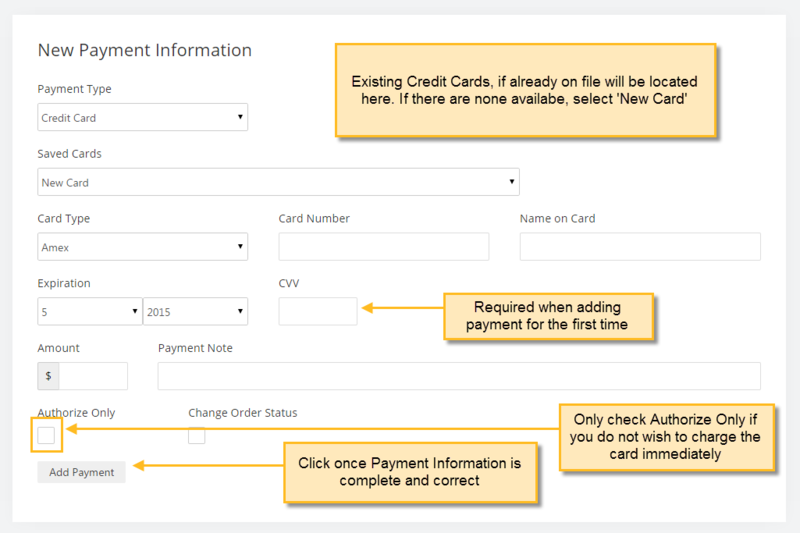 After inputting the other information, you will need to provide the cards CVV number. This will not be necessary for subsequent orders with this card. Check this box if you only want to authorize the amount, and then capture the funds at a later date. Click Add Payment when everything is set as you require. The payment can be Credit Card, or any Custom Payment Type you have created. If your payments are set to Authorize Only, your Payment Gateway only verifies that the funds are available. You can ensure the purchase isn't fraudulent (this is done outside of AmeriCommerce online store). If you're sure it is not fraudulent, then you can Approve the transaction. Approval means you feel the order is legitimate and you intend to capture and process the funds. The Details area will contain transaction details when communicating with the gateway. It will have error codes if the process has been declined for some reason. You may need to consult with the gateway to determine the response code. This is the amount authorized. If it is different than the balance, then the order was likely modified after the funds were authorized. After a transaction has been approved, you will see Capt next to the recycle bin. This is short for Capture. Clicking this link will capture the specified amount. The link will change to Ref (for Refund), once the funds have been successfully captured. This area of the details will indicate a successful or failed transaction. If the text is green, the process was successful. If it is red, there was a problem, which will usually be indicated in the following details text. This is normally the authorized amount, but it can be adjusted if necessary. The amount it can be adjusted depends on what your Payment Gateway Provider allows. Operates exactly like Capturing the funds. Click the Ref link (that replaced the Capt link) under the Recycle Bin, and you're done. This will default to the full amount. You can type in a lower amount in the box before clicking the Ref link for a partial refund. The amount you enter should represent the amount you want to refund as a positive value. If you want to refund $15.00, you enter 15.00. The resulting refund (credit) is displayed as a new line item. How to Manage Transactions Captured Outside AmeriCommerce online stores. When does this apply? - When you do not capture funds through AmeriCommerce online stores. A customer purchases your merchandise. After the order, they determine that they want something added or removed from the order. The original amount was already authorized, and there is no way to revoke/void this. When approving the transaction, there will be a difference the customer can see on the order. NOTE: This is not an issue if you capture funds through AmeriCommerce online stores . You can adjust the amount you wish to capture so that it reflects the balance. Do this by going to Settings -> Payments & Taxes > Custom Payment Types. Ensure the Admin Only (Hide) box is checked, give it a name, and ideally a small description (See above). Click the Save button when done. 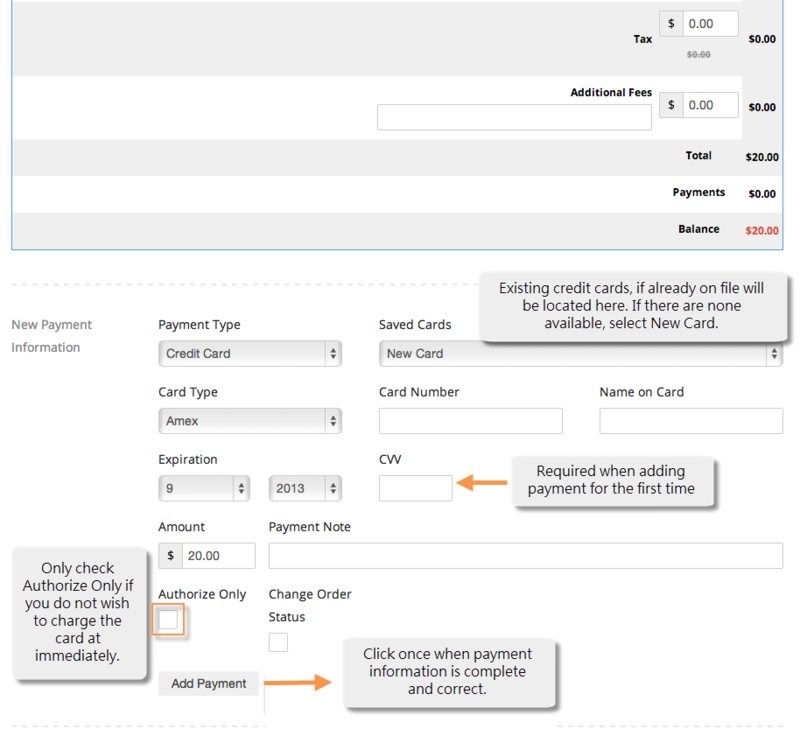 Edit the order, and use the new Payment Type you just created to cover the difference in the order. Since the orders capture outside of AmeriCommerce, and authorized amounts cannot change, the order will never be in balance. 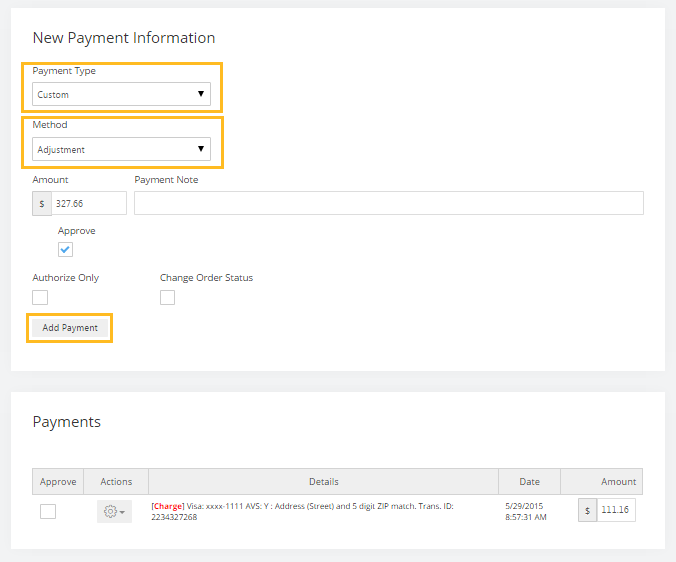 Creating the Admin Only (Hide) Payment Type means that order is only visible on the Order Edit screen, and will never be seen by your customers. Using this method as if it was a cash payment allows you to override these issues when capturing funds outside AmeriCommerce. Use these steps when you have an imbalance in the authorized amount and the actual amount. The refund link isn't working. Less than 24 hours after charging the card, using the refund "button" does not connect to our Chase Paymentech Orbital Payment Gateway. The refund option will not work until the credit card charges have been settled. For most gateways transactions are settled every night. So the rule of thumb is if the transaction to be refunded happened before midnight PST you need to void it. If it happens after that you need to issue a refund. Our payment processor settles every night. We have been dealing with this issue since summer 2012. Feel free to catch up with our Request #9487. For us, it really doesn't seem to make a difference as the amount of time between charging and refunding. Inconsistent results are the issue.